How to get rid of a runny or stuffy nose using acupressure-based pressure points. Are you sick with the flu, a sinus infection, a common cold, or some other kind of illness that has given you a stuff or runny nose all day? The good news is that acupressure points for a stuffy or runny nose actually exist! Yes, acupressure-based pressure points can be used to treat your stuffy or runny nose as a result of illness including common colds, influenza, and other types of illness. How can acupressure help with a runny or stuffy nose from a cold? Acupressure points work by stimulating the energy, traditionally called chi or qi, which flows through your body. By stimulating this energy, healing is promoted through the various parts of the body. Most acupressure points lie along what's called an acupuncture meridian. Acupuncture meridians are the pathways of energy that flow throughout the body. Nearly every spot on your body is on top of or right next to one of the various acupuncture/acupressure points. This is because there are literally hundreds of different spots along the energy meridians that are known as acupuncture points. These special locations are spots at which energy can be easily stimulated by an outside force. You may know of acupuncture by its use of needles to stimulate these special locations. But what you may not have known is that before people used needles to stimulate these points, they used to use their hands and fingers instead. In fact, many people believe that using your fingers to stimulate these acupressure points can be just as effective at promoting healing energy as using needles to stimulate the same points as acupuncture points. Acupressure points for stuffy or runny nose. So, which points are effective at treating a stuffy or runny nose? Let's take a look. The following list of acupressure points is recommended for cold and flu symptoms, including stuffy and runny noses, by Michael Reed Gach in his book titled Acupressure's Potent Points. You do not have to use every point listed below in order to promote healing of your runny or stuffy nose along with other cold and flu symptoms. However, if you want to abolish your symptoms as fast as possible, I would recommend spending several minutes per day on stimulating each and every one of the points listed below with your fingertips in typical acupressure style. 1. Bladder 36 (top point in image below), on the back of the shoulder. This point is good for stimulating the body's immune system and therefore its resistance to viruses that cause colds and the flu. You should use this point daily if you worry about getting sick during the winter season, or if seasonal sickness is something that you regularly have to deal with. According to the author, these muscles in this location tend to get stiff before the other symptoms of a cold show up in your body. Since this point is on your back, you may want to ask a friend or loved one to press into this acupressure point for you, in order to properly apply pressure to it. 2. Bladder 2, on the inside end of the eyebrow, on the face. This point right next to the eyebrow is used for relieving many eye problems. In this case, however, it is useful for also relieving sinus congestion, headaches in the front of your face, tired and weary eyes (from sickness), and other symptoms of the common cold that typically appear in the face. Interestingly, this point is also used in Gold Standard Emotional Freedom Techniques. 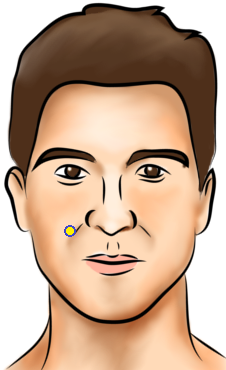 In the EFT tapping method, instead of applying pressure at this point, the user simply taps on the point instead. Both methods can encourage energy stimulation and promote healing. 3. Stomach 3, on the front of the cheek, on the face. This point is useful for relieving your runny and stuffy nose. It also helps relieve many other cold symptoms including pressure in the eyes, fatigue of the eyes, burning sensation and irritation of the eyes, and general feeling of congestion around the face and head. 4. Large Intestine 20, on the side of the nostrils, on the face. This point next to your stuffed up nose is, unsurprisingly, used to relieve nasal symptoms of your common cold and influenza. It helps relieve nasal congestion, pain of the sinuses, and other problems such as swelling around the face. 5. 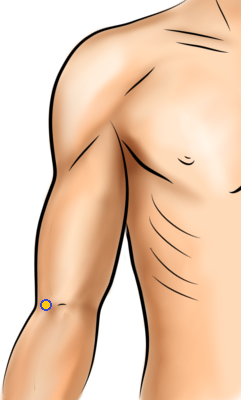 Large Intestine 11, near the elbow, on the arm. This acupressure point is used for relieving all of your cold symptoms, especially a fever. It can also strengthen your immune system in general. 6. Large Intestine 4, somewhat between the thumb and pointer finger, on the hand. The acupressure point located here is not to be used by pregnant women, because it is said that it can cause complications such as contractions within the uterus. For everyone else, this point helps relieve head congestion, constipation, headaches, and other symptoms of colds and influenza. 7. Gallbladder 20, on the bottom back of the skull, behind your head, a bit to the side of the spine. 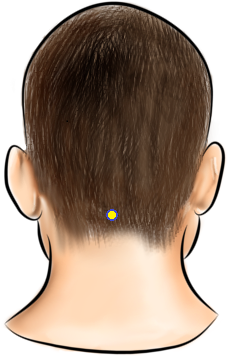 This acupressure location primarily helps relieve symptoms of colds located in the head. It helps relieve headaches, head congestion, neck pain, and general irritability during your sickness. 8. Governing Vessel 16, on the bottom back of the skull, behind your head, in the middle of your spine. Another head point very close to the last point, this pressure point also relieves head symptoms of your cold. It helps reduce and get rid of congestion in the head, red and bloodshot eyes, mental stress especially as exacerbated by your illness, headaches, and stiff neck muscles. 9. Governing Vessel 24.5 (between GV24 and GV25), directly between the eyebrows. This point is famously known as the third eye point because of its location in the middle of the forehead. It helps relieve head problems caused by your cold symptoms, such as head congestion, a stuffy and runny nose, and all types of headaches. 10. Kidney 27, below the collarbone, next to the breastbone. Our final acupressure pressure point is location on your chest. We wouldn't want to leave out our chest point because colds can have a dramatic effect on your lungs and breathing capability. This acupressure point helps with the relief of chest congestion, coughing problems, and difficulty breathing especially as caused by aforementioned congestion. It can also help relieve sore throats. Is your runny nose gone yet? I hope so! Well, there you have it. All ten of these acupressure locations should help relieve your runny and stuffy nose from a cold or typical influenza infection. These acupressure points should also help many other symptoms of your cold such as headaches and congestion of the nasal passage and throat.